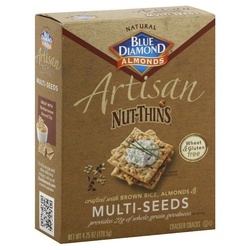 Whether you avoid gluten or simply like a great-tasting cracker, Multi-Seed Artisan Nut Thins just might be your new favorite. We craft them from brown rice, almonds, and six kinds of seeds (quinoa, flax, millet, amaranth, sesame, and black sesame). The result is a distinct blend of flavors in a baked cracker with a snappy crunch. Great with cheeses and spreads. Perfect for dipping. Or grab a handful for 21 grams of whole-grain goodness per serving.